Dan Arnold was a first-team Division III All-American for UW–Platteville in 2016. 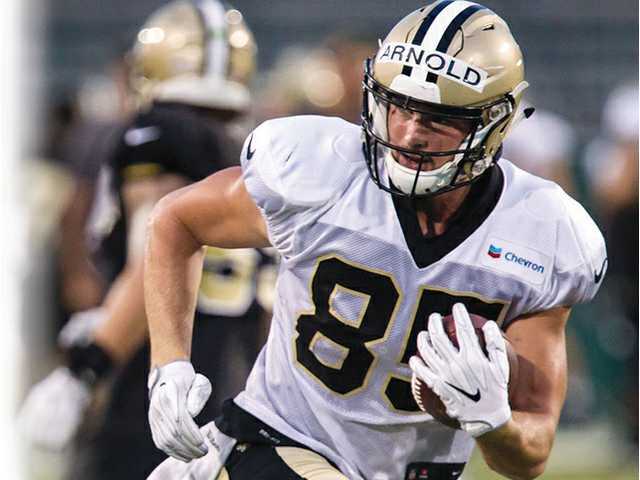 POSTED September 7, 2018 11:11 a.m.
NEW ORLEANS — Former UW–Platteville All-American wide receiver Dan Arnold has made the New Orleans Saints 53-man roster as a tight end. The converted wide out was originally signed by the Saints as an undrafted free agent in April 2017 after a record-setting career for the Pioneers, but an undisclosed injury forced Aronld, to spent the entire 2017 season on injured reserve. A long shot to make the Saints roster at the start of training camp, impressed the club throughout August workouts and preseason games with his pass-catching ability and athleticism. The 6’6”, 220-pound — and growing — Arnold began bulking in the off-season for an impending position change and played his way to a spot on the Saints’ 53-man roster as the team’s third tight end behind 37-year-old Ben Watson and six-year veteran Josh Hill. Arnold had a pair of catches for 36 yards in the Saints’ preseason finale on Thursday, a 28–0 victory over the Los Angeles Rams. He finished the preseason with five catches for 53 yards. Arnold will officially begin his NFL career when the Saints kickoff the 2018 regular season Sunday at home against NFC South rival the Tampa Bay Buccaneers at noon. As a college standout, he caught 65 passes for 1,176 yards and a Pioneer-record 16 touchdowns as a senior in 2016 while leading UW–Platteville to an 8–3 record an a berth in the NCAA Division III playoffs. He earned also WIAC Offensive Player of the Year honors as well as first team D3football.com All-West Region and first-team All-American honors. He finished his Pioneer career with 124 receptions for 2,195 yards and 30 touchdowns. Arnold was also a three-time NCAA Division III track and field All-American in the hurdles (once indoor, twice outdoors) and holds the UW–Platteville school records in the indoor 60-meter high hurdles (7.85 seconds) and the outdoor 110-meter high hurdles (13.91).